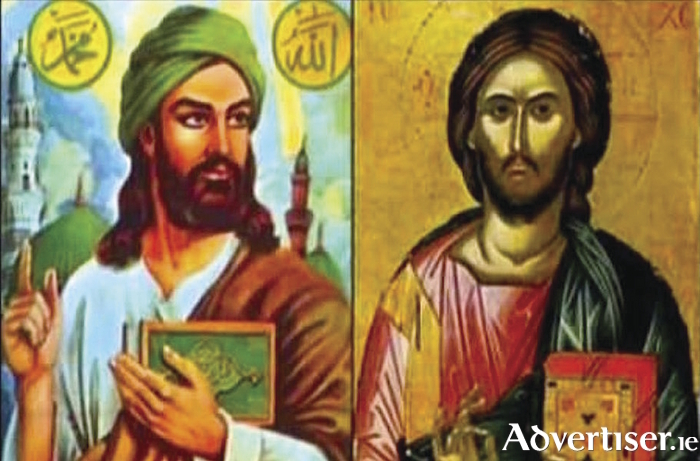 Muslim and Christian depictions of Jesus. Galway Christians and Muslims will gather for an alternative interfaith service this Good Friday - April 14 - which will also involve discussion on the life and death of Jesus, and the differing interpretations both faiths have of him. The event, which will be hosted by the Religious Society of Friends, takes place in the St Nicholas Parochial School Hall at 7pm, with the theme being 'Crucifixion, Resurrection and the Grand Commission'. Christianity and Islam both revere Jesus. Both see him as sent by God to preach the Divine Word, and both religions believe he will return at the End of Time. Where they differ is over Jesus's nature - was he human or divine? - and whether or not he was crucified. The crucifixion is central to Christian theology, whereas Muslims believe God took Jesus up to heaven to spare him the indignation his enemies had planned. Dr Ali Selim (Islamic Cultural Centre ), Billy Hamilton (Covenant Christian Fellowship ), Fr Charlie Davy, and Richard Kimball (Religious Society of Friends ), will debate and discuss these issues, and consider if Muslims and Christians overcome their theological differences and cooperate to help build more just and faithful societies? All are welcome to the event.